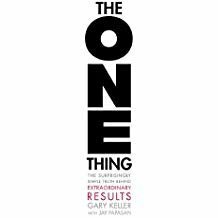 This book was recommended to me by my business coach (Thanks Mandy) and also was recommended reading from my December interview on books (Watch now). Yep, it is a great book at focusing your efforts and energy to ONE thing that is the most important thing to you now. Each day. Each moment, before you begin doing things, you stop and determine the “ONE thing that you can do such that by doing it everything else will be easier or unnecessary. It is filled with activities and thought-provoking questions to get you to realize that doing less is actually doing more. This is focused on your work but can be applied to personal, spiritual, school, worship, your community, and all areas of your life. My ONE thing right now is to finish my book, A Field Guide for Career Practitioners, and I begin every day with 1-2 hours of writing, editing, or other book-related things. I create a ‘to do’ list of three things and this is always #1. The author would have you do a ‘to do’ list of one (1) thing and allot 4 hours to it each day. Not sure I can juggle all that needs to get done by giving it 4 hours, but I like his idea…keep it simple, focused, and say no to anything during that time which does not support your ONE thing. Throughout the book are links to additional resources, like this to help you discover your ONE thing. (Here’s one) and I have yet to explore those but I can only assume they will be helpful. If you feel scattered and not sure how to rein in the ‘tsunami of information’ in your life, check this book out.